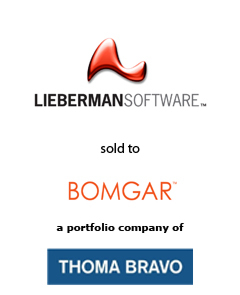 AGC Partners is pleased to announce that its client, Lieberman Software Corporation, a leader in privileged identity & credential management, has been acquired by Bomgar Corporation, a portfolio company of Thoma Bravo that provides secure access solutions. The acquisition of Lieberman Software enables Bomgar to take a big leap forward to create a best-in-class Privileged Access and Identity portfolio. With a team led by Maria Lewis Kussmaul and Eric Davis, AGC Partners acted as the sole financial advisor to Lieberman.